Easter is sure to be extra sweet with this collection of six rice crispy treats, perfect for loved ones, teachers, kids or simply bringing to the office. Hand made from fine chocolate and all natural ingredients, these rice crispy treats arrive in a gift box ready to make Easter special. Three Bunny Frosted Rice Crispy Treats. Three Carrot Shaped Frosted Rice Crispy Treats. Each confection is individually wrapped for freshness and arranged in a perfect gift box. 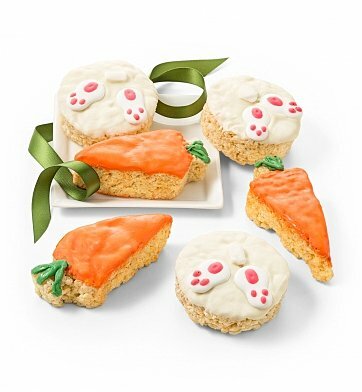 Easter Rice Crispy Bunnies and Carrots is a hand delivered gift. These gifts are delivered by one of our local design centers located throughout the United States and Canada. Same day delivery is available for most gifts when ordered before the cutoff time. The cutoff time for Easter Rice Crispy Bunnies and Carrots is in the recipient's time zone.